Me with an adult pollock. Science and Technology Log: It’s Getting Fishy! Alaska pollock are found in the Bering Sea and Gulf of Alaska and are part of the cod family. The dorsal side of the pollock is speckled brown in color with a slight olive green hue and the ventral side is silver. They eat krill, copepods, and small fish – mainly their own offspring. They quickly grow into adults, reaching reproductive age after 3-4 years, and are very fertile, replacing harvested fish in just a few years. Pollock swim in large schools during the day and disperse overnight. They can be found throughout the water column, but young pollock tend to live in the mid-water region while the older fish tend to live near the sea floor. 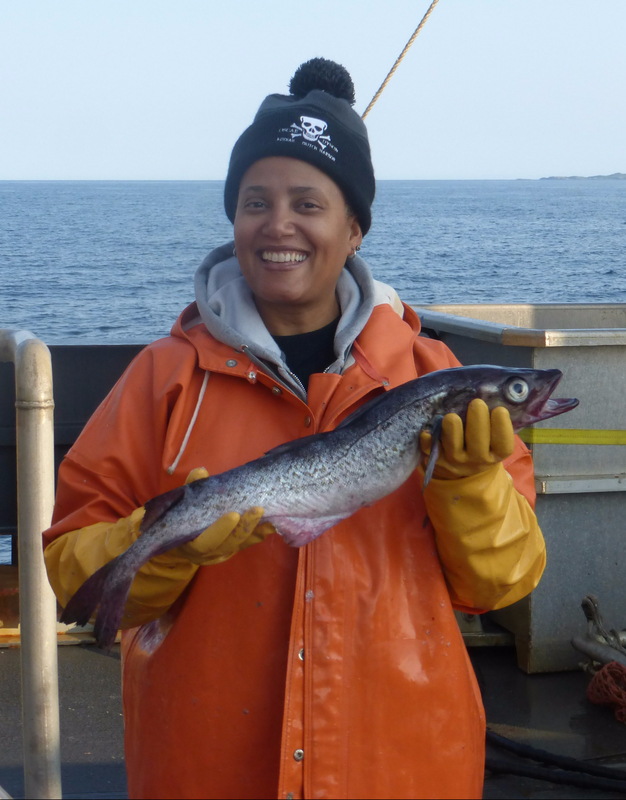 Science-based monitoring and management play a key role in the sustainability of the Alaska pollock fishery. It is managed by the North Pacific Fishery Management Council based on data provided by the NOAA’s Alaska Fisheries Science Center. The Alaska pollock fishery is the largest, by volume, in the United States and one of the most valuable in the world. Products made from pollock include fish fillet, roe eggs, and imitation crab. The entire industry is valued at over a billion dollars. It is also considered one of the best-managed fisheries in the world. Scientists from the Alaska Fisheries Science Center conduct acoustic trawl surveys to estimate the abundance of Alaska pollock using acoustics and by catching small samples. While on NOAA Ship Oscar Dyson I had the opportunity to spend time in the fish lab learning how pollock data are collected.. This video is an example of what I experienced. The main way commercial pollock is caught in the United States is by net. Scientifically trained observers are sent out on U.S. pollock fishing boats and, similar to the NOAA scientists, they collect sample data from each catch and send it back to NOAA. They also observe the fishing practices on the boat and report any regulatory infractions. All the collected data and interactions between the fishing industry and NOAA have been established to make sure the Alaska pollock fishery remains sustainable. What is your current position on Oscar Dyson? I loved exploring sea creatures a the beach as a kid; Jacques Cousteau. Getting out of the office; Seeing amazing scientists do their work and getting to participate. The information we collect plays a very important role in managing fisheries in Alaska, providing economic and food security for many people. We also do tremendous research that benefits the science community and subsequently people world-wide. We are among the leaders in understanding fish and invertebrate abundance and behavior in the world. I’m still trying to figure out what I want to do if I grow up! Probably between 10 and 13 years old I developed an interest in the ocean. Leading a group of scientists is, in some ways, like herding a group of very intelligent cats. They are very focused on their research and have very strong opinions about things that they feel could detract their ability to do the best job possible. This can be a challenge for me at times, but is a great problem to have! Being able to facilitate scientists and help them accomplish their goals is very rewarding. Rescuing a family in a life raft that had been missing for 3+ days. As Survey Technicians, our primary responsibility is to monitor and maintain fisheries and oceanographic equipment. In addition, we have to run and verify the Scientific Computer System (SCS) is collecting quality data and all the ship’s sensors connected to SCS are working properly. We also are the liaison between scientists and the crew members, and assist the scientists with any part of their research. Survey Technicians have the unique opportunity to participate in all aspects of the fisheries or oceanographic operation start to finish. During the fishing operations: 1. Scientist communicates to the people on the bridge, deck and survey technicians when they are going to fishing. 2. We put the fishing equipment on the net, as the net is casting out. 3. Assist the scientists log net dimension data when the net is in the water. 4. As the net is being recovered, we retrieve all the fishing equipment. 5. We help the deck with emptying the catch on the fish table, when needed. 6. Lastly, which is my favorite part, is when we get to assist the scientists collect biological fish samples in the wet lab. During oceanographic operations we are in charge of deploying and recovering the equipment (Conductivity, Temperature and Depth (CTD)). In addition we verify all the sensors on the CTD are presenting quality real time data. From the CTD we can collect water samples that can be used for several studies, like salinity, dissolved oxygen, chlorophyll, or micro plankton. We are able to see the operations in action, understand the importance of the research through the science perspective and ultimately know the reason the Oscar Dyson is in the middle of the Gulf of Alaska. I am one of two Survey Technicians on the Oscar Dyson. I have been working on the Oscar Dyson about 10 months. My fascination for the ocean started when I was young playing with the anemones on the rocky intertidal beach. I’ve always enjoyed being at the beach and seeing the organisms there. I became curious of life at sea and really wanted to see the marine wild life in action, especially when the ice first melts and there is a high abundance of phytoplankton and zooplankton that attracts marine mammals, birds and fish to migrate there. Being on the Oscar Dyson, I was able to observe the fluctuation between high abundance of phytoplankton, zooplankton or fish, depending on the area and time of year. I enjoy seeing the scenery. Like the untouched lands, glaciers, marine wild life; the fishes, mammals or birds. Also I like seeing the endless blue of the ocean, especially calm weather. Really puts the vastness of the ocean in perspective. The reason I pursued a career in studying the ocean is because I come to realize that people take the ocean for granted and don’t recognize how much we depend on it. I obtained a Bachelor’s of Science degree in Biology emphasis marine. One of my favorite college courses was oceanography. It was the first time for me to see the connection between geology, physics, chemistry and biology in one scenario like in the ocean processes. Each component relies on the other. First the geological features of the ocean floor and land masses influences the physics of the current flow, wave motion, and up-welling. Then the ocean movement determines the mixing and distribution of the water chemistry. Finally the biodiversity, location, and populations of marine organisms rely on the water chemistry, like nutrients or dissolved oxygen. I really enjoyed learning about the variety of sea creatures in the Gulf of Alaska. Here is a video showing a few of the sea creatures I encountered. Totally amazing! Another cool resources is the Fishwatch website. Here you can learn more information about sustainable fisheries and the science behind the fish we eat. It is worth checking out! Did you know that fresh pollock have a very distinctive smell that isn’t like any other fish? It’s not fishy – more like dirty feet! 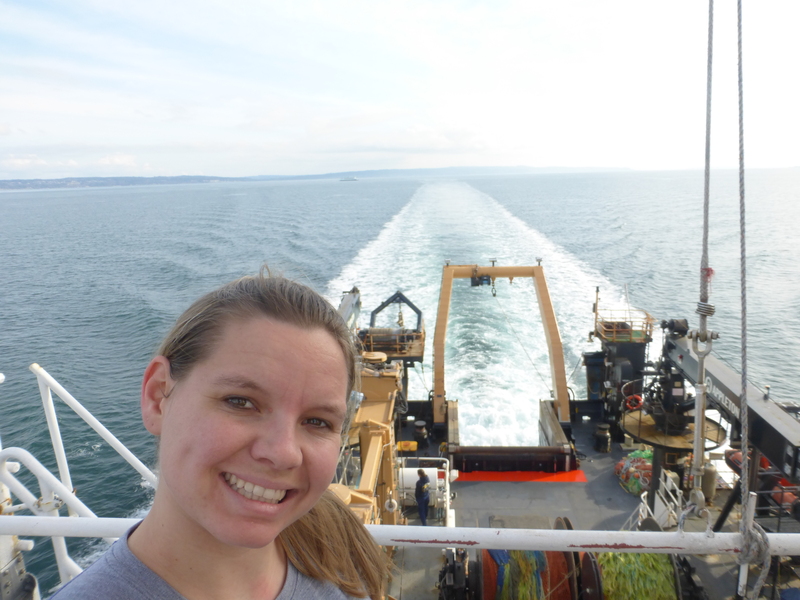 This entry was posted in 2017, NOAA Teacher at Sea, Sian Proctor and tagged Alaska Pollock, fisheries management, gulf of alaska, interviews, NOAA Ship Oscar Dyson, Pollock. Bookmark the permalink. NICE JOB, Sian!!!! So interesting to see exactly what goes on with fish research. I had no idea and also no idea that fish populations could be fished regularly and still be sustainable. Nicely done! Another great video. I still have some otoliths from my cruise, great teaching aid.